While the Panatrope was popular and well known, its price kept it out of all but the most affluent homes. Brunswick desperately need to come out with a new line of acoustic phonographs to compete with the Victor Orthophonics. It did so rather quickly, offering a modern line of phonographs with larger horns and aluminum sound box diaphragms. Initially, these were simply called “The New Brunswick Phonographs”. 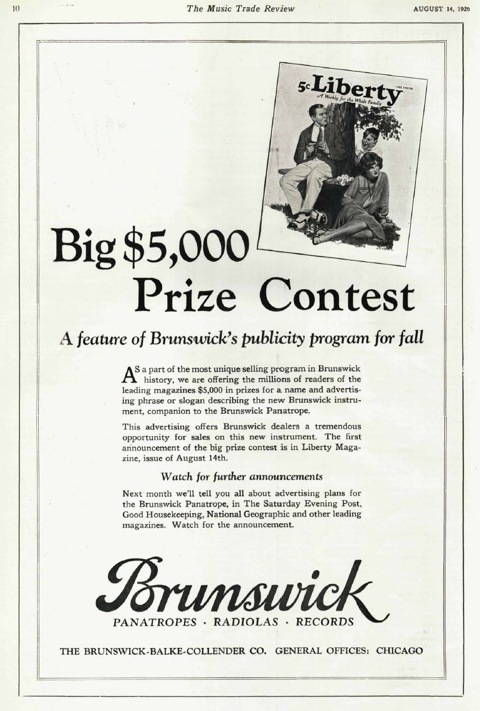 In August of 1926, the company announced a contest for a new name, offering the winner a $5000 prize. 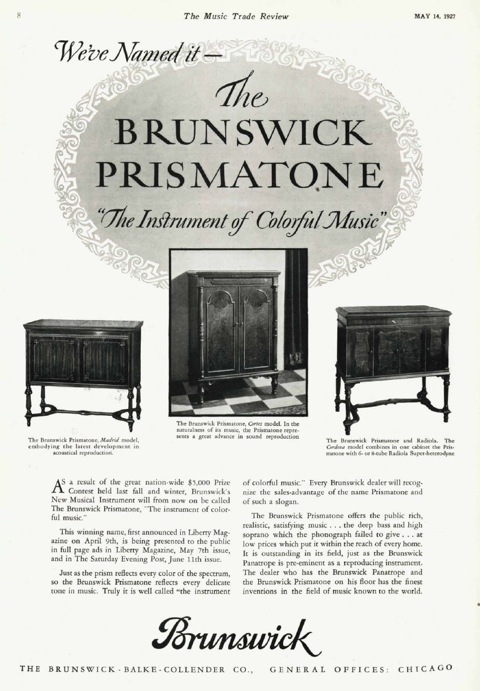 The contest-winning name for the new Brunswick acoustical phonograph was “Prismatone”, and it was announced in May, 1927. Within a very short time, the Prismatone name was dropped in favor of “Brunswick Panatrope (Exponential Style)”. This could indicate that the Panatrope name by this time was so well known that the company wanted to capitalize on it, or it could indicate that the name Prismatone had already been trademarked by some other company. A British company had earlier used the name Prismaphone for their phonograph, which may have been seen as causing confusion.